Everybody knows that the holidays can get expensive and busy. Today’s project is a fun idea for you that won’t break the bank. It will also be super easy and quick for you to make. 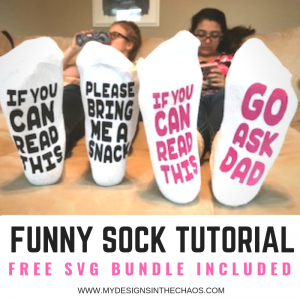 Socks with funny sayings on the bottom in heat transfer vinyl are sure to be a huge hit. They would be great for a stocking stuffer, secret santa gift exchange, or even as a accent on gift wrap. 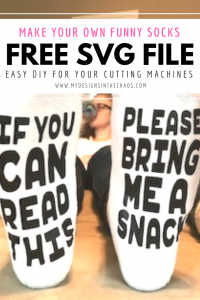 Let me show you exactly how easy they are and give you a FREE SVG so you can make your own. In three easy steps you will have adorable funny gifts for the holiday season. Please note that this post does contain affiliate link to products that we know and love. That means when you shop through our links at no extra cost to you we earn a small percentage of the sale. The first thing that you need to do for this project is to select which design combo you want on the socks. We have provided a full bundle below with several mix and match options that would be cute together. Once the design is selected go ahead and cut and weed the design. Curious what I mean when I say weed the design? Check out this post here for common terms used in the crafting world. Since this is heat transfer vinyl be sure to mirror your image in the design program. There is nothing less frustrating than cutting a full design and then realizing it is all wasted because you forgot to mirror. 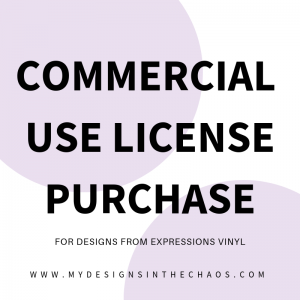 (been there) Over in this post we talk about tips to waste as little vinyl as possible. Once the design is cut and weeded it’s time to line it up on the socks. First double check that the bottom of the sock is the side facing up that the design will be applied to. The best way to make sure you are on the right side, is to use the hell and the toe seam as a guide. Line up design on the bottom of the socks. Now it’s time to press the design onto the socks. As we learned on our Facebook live (thank you for y’alls grace and patience with me) when using the flocked HTV make sure to peel the carrier sheet off once it has cooled. For standard HTV it isn’t necessary to wait, you can peel hot. All done! In 3 simple steps, you can have an adorable gift that will bring smiles to everyone who opens it. If you plan on making a bunch do this assembly line style. Cut everything at once, weed the designs at once, and then press at once. You can fit a TON of pairs of socks under the heat press! We have included tons of saying in this adorable bundle for you to mix and match whichever design best suites you and the person you are giving the socks to. We can’t wait to see your finished pairs of socks and how creative you get with the sayings! Post over in our FB group or on our FB page. It’s so fun to see everyone’s special touch on their own creations! Also don’t forget to pin this post for the future and share this post with a friend who loves to craft.